We are a closely managed, hands-on company where ownership takes a direct role in the daily running of the company including dealing with customers on specific orders. Our 80 years (!) 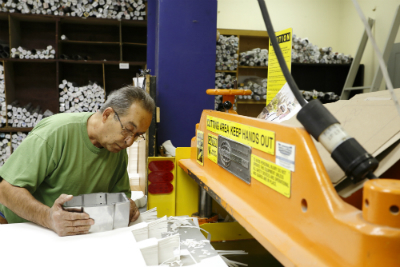 combined experience among the three main partners in envelope converting and envelope printing is a resource our customers count on for advice and suggestions. In most envelope companies, Adjustor/Mechanics are usually spread over several machines. At Elite, each of our Adjustors handles only one machine which means a greater attention to detail and quality. We also employ the finest and most experienced Adjustors around like Ronny Blood (picture below).